When I think of sepia ink, I think of a deep, rich walnut tone. Visions of antique documents and intricate scrimshaw come to mind. 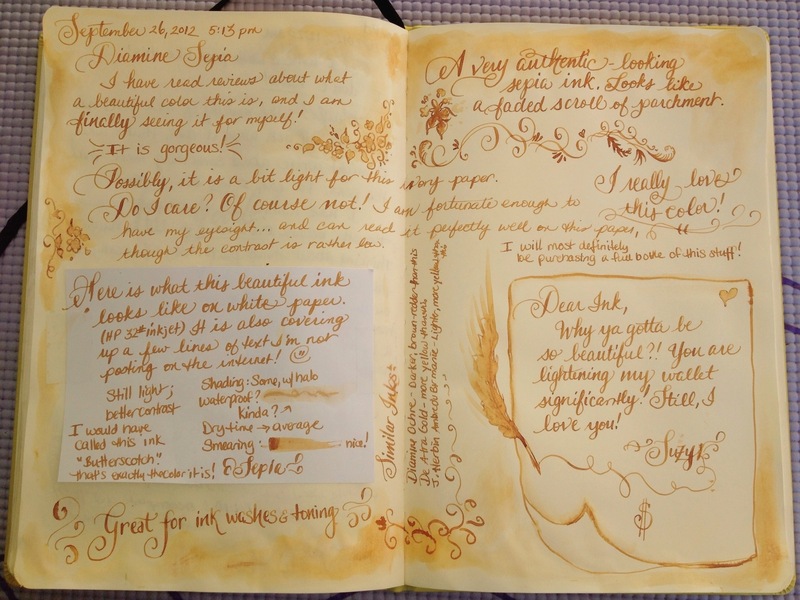 Diamine Sepia is different. It isn’t the color of centuries-old writing, but more the color of the parchment it’s written on. It is a gorgous, warm butterscotch shade. In fact, if it were my ink, I would have named it just that. Butterscotch. I can’t look at this ink without craving a butterscotch ice cream sundae, complete with crushed peanuts, fresh whipped cream and a cherry on top! Now that I’m hungry, I’ll simply post my review and let you be the judge. Either way, it’s beautiful! A full bottle of this is definitely in my near future! In Short: smooth flow, average dry time, mostly not waterproof, good shading with some haloing. I also noticed that it darkened up slightly as it dried overnight. Interesting!